Our work is motivated by the need to manage data on a collection of storage devices to handle dynamically changing demand. As demand for data changes, the system needs to automatically respond to changes in demand for different data items. The problem of computing a migration plan among the storage devices is called the data migration problem. This problem was shown to be NP-hard, and an approximation algorithm achieving an approximation factor of 9.5 was presented for the half-duplex communication model in [Khuller, Kim and Wan: Algorithms for Data Migration with Cloning, SIAM J. on Computing, Vol. 33(2):448–461 (2004)]. 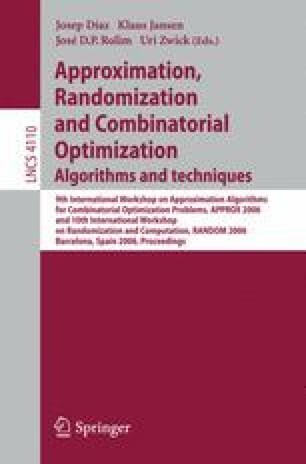 In this paper we develop an improved approximation algorithm that gives a bound of 6.5+o(1) using various new ideas. In addition, we develop better algorithms using external disks and get an approximation factor of 4.5. We also consider the full duplex communication model and develop an improved bound of 4 +o(1) for this model, with no external disks.